Money is really about emotions. People often think of money in technical terms. Stock markets, investment portfolios, tax returns…blah, blah, blah. But that’s missing the point. Money is really about emotions. We use money to fulfill three emotional needs: security, happiness, and love. If something doesn’t help us avoid discomfort, achieve happiness, or take care of other people, we don’t spend money on it. And, unsurprisingly, when you put two people together with conflicting ideas about how money should fulfill those needs, things can get a little…emotional. Relationships and money are notoriously tricky. But remember that you and your partner are working together to fulfill the same emotional needs, and just like every other aspect of your relationship, dealing with money takes effort and compromise. 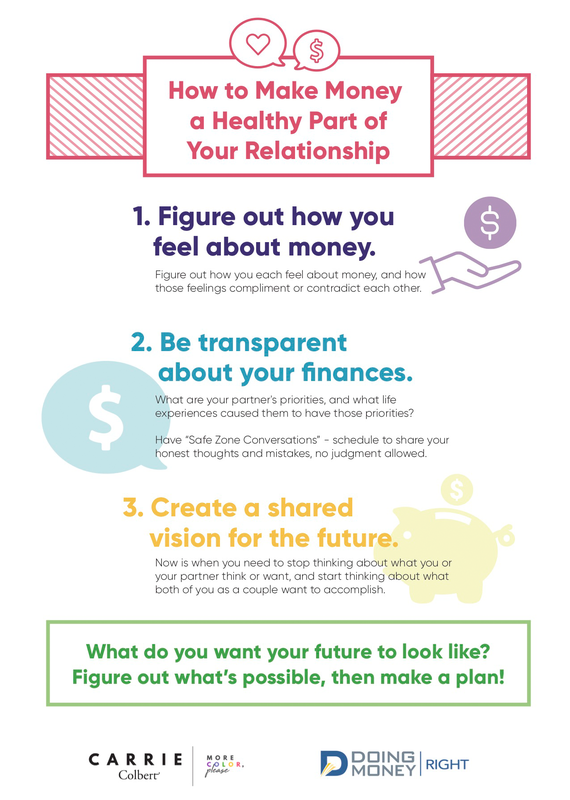 Here’s how you can make money a healthy part of your relationship. 1. Figure out how you feel about money. Unless you’re in a relationship with your identical twin—which, first of all, gross—then you and your partner have had different upbringings and life experiences. This isn’t something that either of you have control over, but it is important to recognize what a huge roll this plays in how you each make money decisions. Think back to one of the emotional needs that money fulfills: security. This often means having the same or better lifestyle than you did growing up, and not worrying about falling into poverty. But what if ‘security’ for you means a two-story house and money saved for retirement, while your partner is happy so long as the bills are paid? Figure out how you each feel about money, and how those feelings compliment or contradict each other. We’ve developed a free quiz called the Money Mind® to help with this exact problem, and I recommend you and your partner take it together to find out what money means to each of you. 2. Be transparent about your finances. Transparency is crucial when it comes to dealing with money in relationships, and it’s often the point where things break down. Why? Because transparency often leads to conflict. You and your partner have different priorities, which leads you to want different things. However, instead of finding a compromise, sometimes we take the selfish way out, either by keeping our spending a secret or by micromanaging our partner’s spending until they give in. First, take what you learned from step #1 and put yourself in your partner’s shoes. What are their priorities, and what life experiences caused them to have those priorities? Keep in mind that their priorities are just as important as yours. My wife and I have what we call “Safe Zone Conversations”. These are times that we specifically schedule to share our honest thoughts and mistakes, no judgment allowed. This can help to create that vital transparency without the fear of conflict. Yeah we actually didn’t notice. But you still shouldn’t do it! 3. Create a shared vision for the future. Now is when you need to stop thinking about what you or your partner think or want, and start thinking about what both of you as a couple want to accomplish. What do you want your future to look like? Be honest with each other, and keep in mind what your partner’s priorities are. If they want something that isn’t a priority for you, don’t hold it against them, but try to come up with a compromise that meets both of your needs. Figure out what’s possible, then make a plan! You might have to sacrifice a little security to achieve happiness. If, for example, one of you wants to go into a risky career or start a new business, understand the impact that will have on your partner. On the other hand, if having kids or taking care of family members is a priority, you might have to sacrifice some short term happiness for the sake of love and security. There’s no right or wrong answer here. So long as you and your partner are on the same path, you’ll find that dealing with money isn’t just some complicated chore that must be performed; it’s the fuel to accomplish your dreams. 1. You can download a free printable of the infographic HERE. Pin it, save it, share it with friends! 2. Read the other articles in our “Doing money right” series. 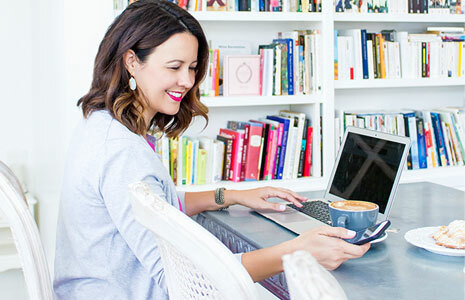 And you can sign up HERE to receive weekly tips and tricks on finance, education, home buying, insurance, Social Security and everything in between from Byron. 3. Have a great day! Thanks, Erin! Glad you enjoyed. Thank you for sharing, friend! Can a colorful statement-making sequin stripe dress be worn different ways? The answer is yes! I'll show you how and where to wear it.